Met with a friend for beers and some snacks the other night at a newish place on Bergen Street between Smith and Court known as 61 Local. The joint specializes in doing the local thing–independent beer and wine operations from NY, upstate, Long Island, and nearby Pennsylvania, etc. All the meats, cheeses, breads, honey are localized products–and they were well chosen well. Beers included drafts from Captain Lawrence, Barrier Brewing Co. (of Oceanside), Ommegang, Sixpoint, Kelso, Ithaca, South Hampton, Ramstein, and the Red Hook Winery. While I certainly believe there is overkill on having to have things that are local, you still have to judge a place on the quality of what it’s serving and vibe. 61 Local scored on all counts. Side note: On the local thing becoming absurd, make sure to watch the hilarious satire of a couple asking where their chicken came from from the show Portlandia. Well done, Armisen & Brownstein. 61 Local dubs itself a “public house” and it had the feel of something between a beer hall and a gallery space. The night we were there, an engagement party was still going on from earlier in the afternoon, so there were plenty of people in the large space. Given that there are a number of galleries on the same block, 61 Local fits in well with its Bergen Street location–not to mention its half-block proximity to the F & G trains at the Bergen Street stop. I tried a Captain Lawrence Freschester Pale Ale I had never had before and it was tasty. I also had a dry cider from somewhere in New Hampshire which was quite dry and cut through the excellent meats and cheeses we sampled. My favorite meat was the sopressata with porcini mushrooms cut super thin from Manhattan’s Salumeria Biellese. Had a little spice with a comforting earthiness from the mushrooms. Also yummy was Dickson’s farmstand coppa–a straight ahead pork-fat explosion that was nice. A few of the other meats we had were spicy, as were one type of pickles and one of the mustards. There was no shortage of flavor or textures. The chicken liver toast was creamy and savory, and the ricotta toast with honey and pistachio was almost like a dessert in its sweetness (though the bread was slightly stale in that one dish–the toasted bread overall was solid). 61 Local serves two types of cheese plates: hard and soft, and we had both. They were all enjoyable, as was the walnut bread and fig jam. I don’t recall a single name of any of them, but you can tell someone knows what they are doing and has made some nice combinations. The space itself has very high ceilings and is decorated tastefully with wall-box sconces, exposed bricks and very nice veneer benches promoting communal imbibing and socializing. There is a cool, very large wire map showing the region with brewers names on it behind the bar. There is also a tree-shaped piece of art on one of the side walls toward the back made from big planks of wood which was nice to look at. Bottom line: It was an enjoyable beer hall atmosphere with an appealing environment that should do well in this neighborhood given our passionate preferences for craft beer and bartenders with hats and facial hair. Advice: Add more wine to the menu as the neighborhood is dying for more places that serve good wine. 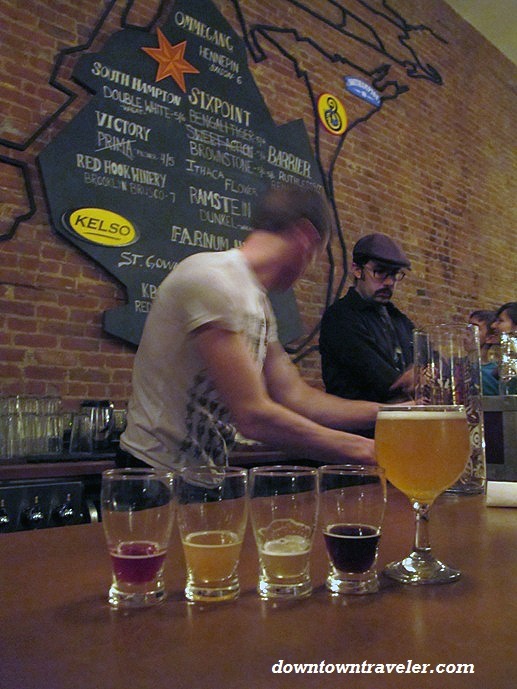 See what 61 Local is pouring today on their beer menu. This entry was posted in Uncategorized and tagged 61 Local, Bars in Cobble Hill, Beer Bars, Bergen & Smith, Brooklyn Bar, Local Beers. Bookmark the permalink.